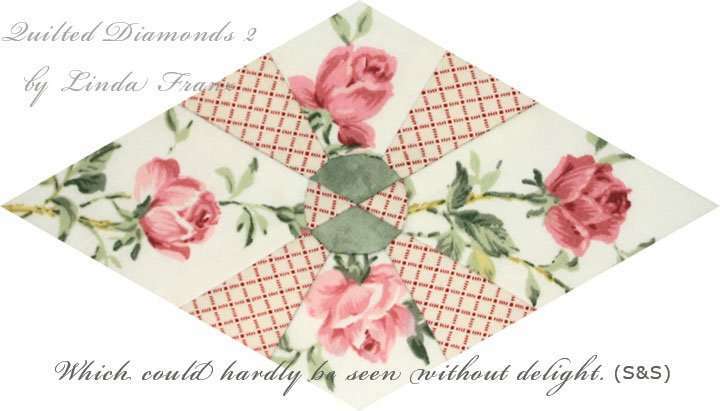 The response to the new Quilted Diamonds Quilt-Along is fabulous. Many Inklingo quilters like you have the books and want some company while they sew. Ahhhh, We can have a place to share photos of our diamonds. When Sandy Arbuthnot first started the DOW when QD1 was new in 2002, none of us were on Facebook and everything was done by email and “Webshots,” which is long gone. 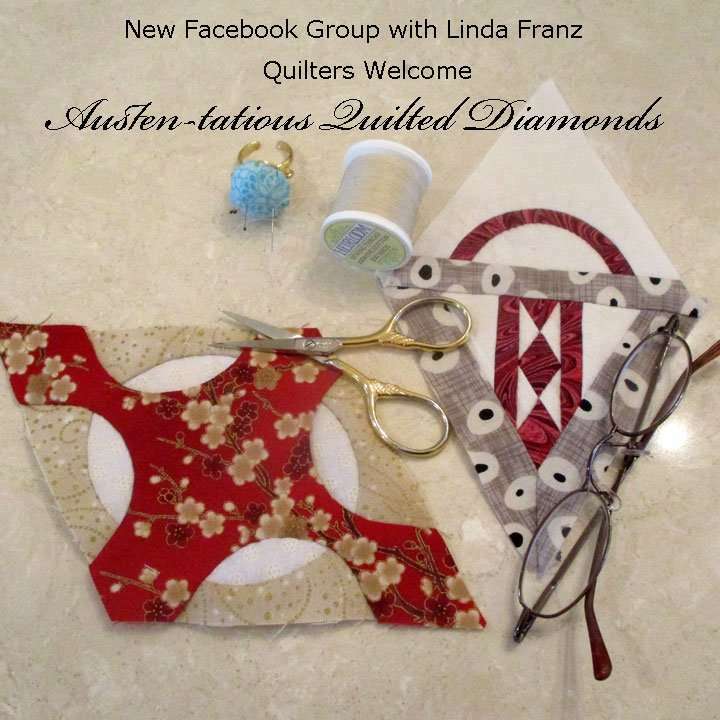 The Facebook group is a friendly, safe place to share your diamonds, get tips and meet other quilters who enjoy the same things you do. You can substitute any diamond for the ones I feature and you can modify them by adding or removing lines. Simplified versions are often just as beautiful (above). This is not a DOW, Diamond of the Week, but I will post info about two diamonds (one from each book) and tips for them a few times a month. Sew at your own pace. 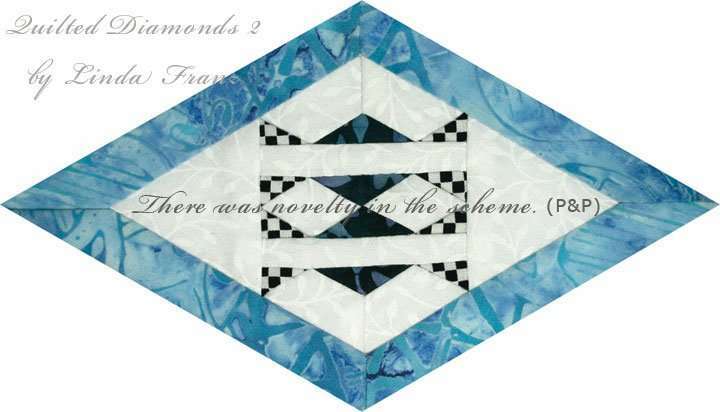 The pieces in the diamonds are small, so most quilters hand piece. 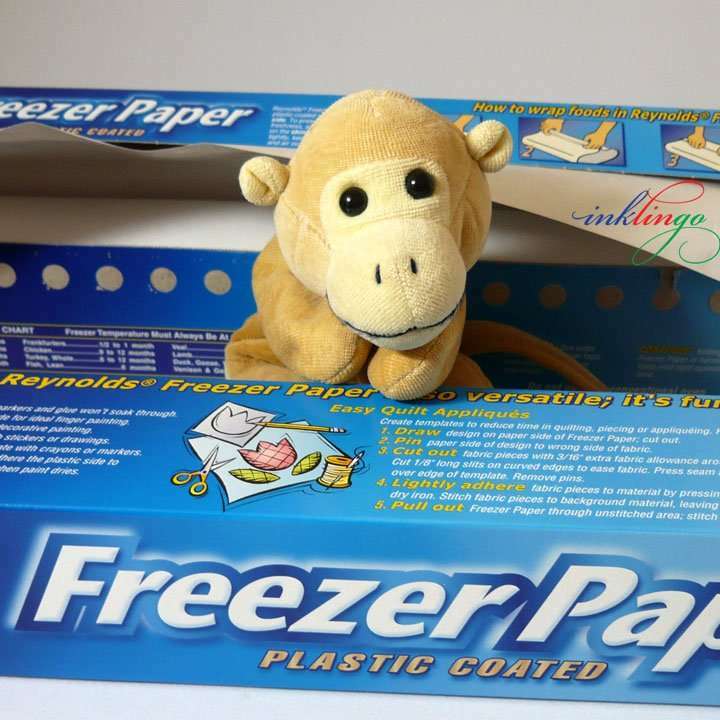 However, freezer paper templates are the best alternative to Inklingo for machine piecing too. It makes sense to keep on teaching the techniques in the QD books because they all apply to Inklingo—the pressing techniques, the sewing techniques, the design notes—and freezer paper templates are always the next best thing when shapes are not Inklingo-able. Both books are available in the Shop but they are NOT absolutely required to get in on the fun because You Can Sew Anything You Can Draw on Freezer Paper. I cannot repeat everything that is explained in the books every time, of course, and anyone who is in the Facebook group probably has at least one of the books, so more instructions are not required. 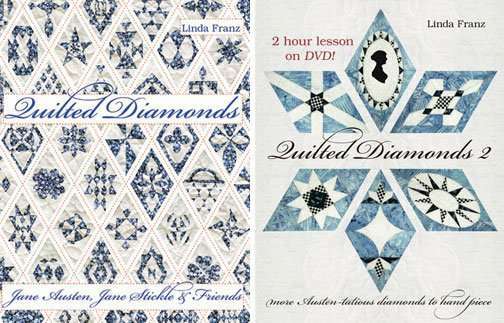 You can see what I mean in the Introduction to the Quilt-Along. Inklingo is all about making quilting more accessible. 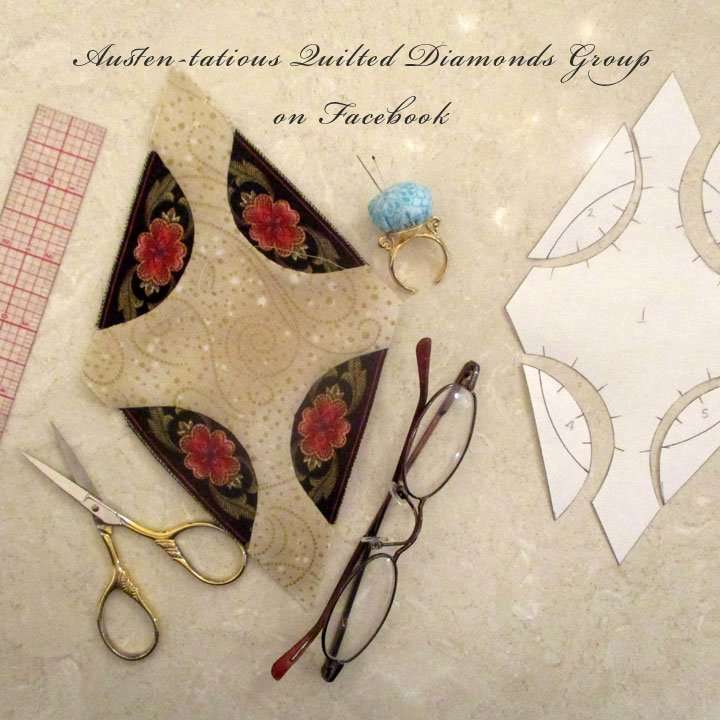 It is not expensive to get started hand piecing with freezer paper templates. 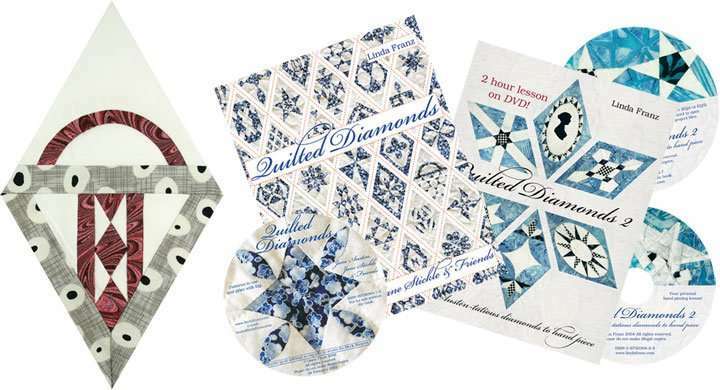 Electric Quilt software (to print on freezer paper from the optional QD CDs) – You can also print larger or smaller diamonds. The only thing I have added to my sewing kit since I wrote the books in 2002 and 2004 is a finger pincushion. (Turn the volume up!) Now, instead of a button and elastic, I buy a “ring blank” from a beading shop and hot glue the pincushion to it. 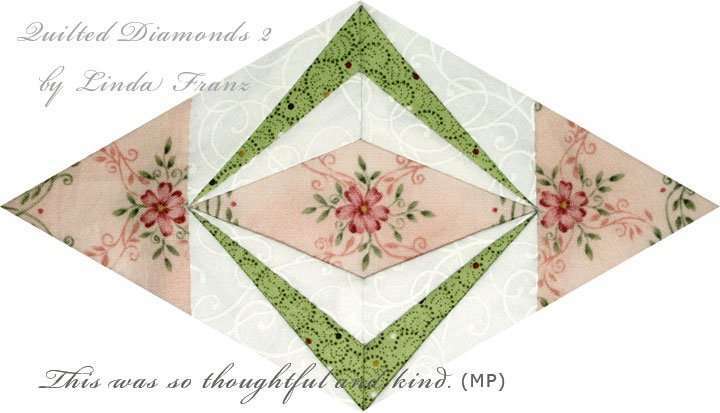 All of my diamonds are named with quotations from Jane Austen’s novels. I am enjoying re-reading the books and all the quotations sprinkled through the text. It was a super-creative, exciting time of my life. No worries! You can stay in touch with the group by joining the Inklingo IO Group (previously on Yahoo). You don’t have to be a hand piecer to participate. 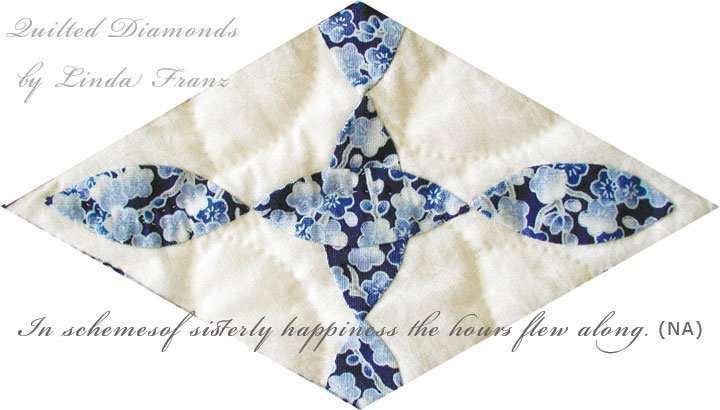 All variations of appliqué, paper piecing, machine piecing and foundation piecing are welcome. Whenever shapes are not available from Inklingo, I recommend freezer paper templates. Printing on fabric has a lot of advantages. See the Main Beginner’s Page for more info about printing—and to get your first shapes, free. It is going to be fun to see your fabric choices and your diamonds. Please post photos of your diamonds! We can share on Facebook, Instagram, Pinterest—anywhere. I can hardly wait to see them!